So, what does Grocemania do? Our platform allows customers to browse and buy from local stores online and have it delivered by local couriers in as little as one hour. Unlike some of the existing delivery options, we have over 20 stores in one app, only a £10 ‘minimum order’ and a flat £2.50 fee. 1. There was a minimum order of at least £40 with existing providers. 2. He found no option to order from local food specialists. 3. Delivery fees start with £4.99 per drop and customer service was generally poor. 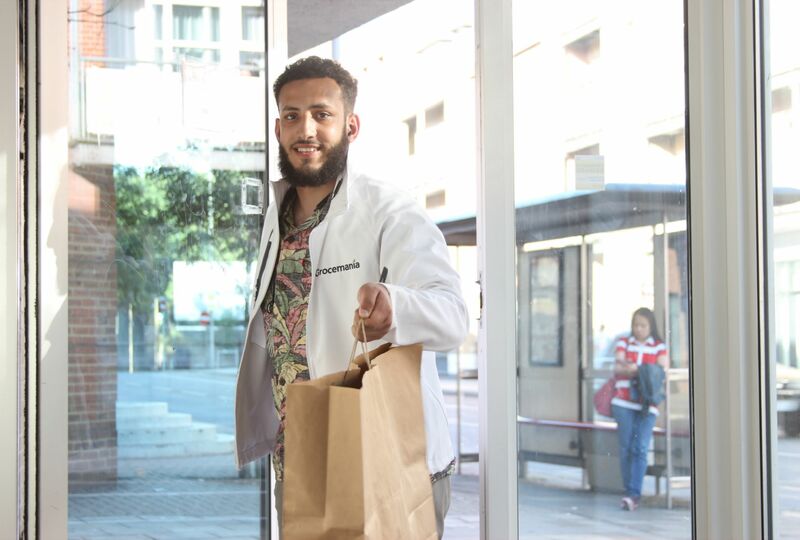 Inspired by Deliveroo’s success, Askar and his partner Ali decided to create a landing page to study the market demand for cheap and fast deliveries. We soon realised there was a demand for the service, started receiving more and more orders and also a number of shops willing to join the platform! The biggest issue on my point of view is always the money and fundraising process. The biggest issue for me, as a non-developer was a lack of knowledge for sure. I didn’t know how many resources exist already to test and prototype you app. For example, TapCart an easy constructor which allows you to launch your app without spending thousands on development. If I knew about all those opportunities from the start, we could have done everything much faster and save a lot of money. Yes, we first started delivering from Tesco Express. Brand Awareness has exploded and we have grown almost 70% MoM! We have been live and running since August 2017 in Surrey and discovered some great traction! 1. Performed over 1500+ orders and 400 active users have joined our platform and using our service weekly. 2. Signed over 20 independent and chain stores to our platform including loca Tesco Express and Londis Stores. 3. Reached the first page of Google organic searches for keywords like grocery delivery London, grocery delivery Kingston etc. 4. Have been mentioned by The Grocer, CITY AM, TNW and gained over 10,000+ followers across all our social media channels. 5. Grown our mailing list newsletter to 1,500 recipients. We have indirect competition arising from players like Ocado, Tesco & Sainsbury’s. However, as mentioned before, many of these are existing retailers with high spending required for one-hour deliveries. Those retailers have significant costs in running and maintaining their delivery infrastructure. Meanwhile, we believe that we can help customers by minimising the costs of delivery and performing orders below the average minimum order value, at the same in-store price. We also have direct competition from other grocery delivery companies such as Beelivery and HomeRun. Our differentiator is that we focus primarily on independent local grocery stores, as opposed to larger supermarkets. We have designed our technology to add and create more shops as the business grows. Our delivery agreement with QuiqUp and signing on a number of Londis stores is a positive move towards scaling the business across the whole of the UK. When anyone can choose the store, they want and get a delivery from the store in minutes without paying any extra! The freshness of the products is a crucial component of the successful formula and we are doing well! Yes, we are currently raising our first seed round with a croudfunding paltfrom Seedrs (seedrs.com/grocemania1) and already reached 67% of our total campaign! The funds will be used to complete the development of Partner Dashboard interface and Stock Control systems. Finally, Askar what is your favourite biscuit? !